Well, we are in our temporary digs here in Seattle—the boys are in school and happily riding their respective buses, my husband has figured out the park and ride and our cars arrived yesterday so I don’t have to drive anyone to their destinations any more. I'm happy to have my very own car back too; it was so weird driving a different (rental) one. We moved here with what we were able to pack into suitcases and bring on the airplane, so that means no sewing machine. For a little while. (Hopefully there will be an update on that very soon!) I brought some bits of my favorite fabrics and have been working on some hexagons. We are in a dark-ish, halfway underground apartment for these first two months, and taking photos is going to be challenging. Back in July I went to a blogger meetup that I then failed to blog about. One of the cool people there was Leigh, who blogs at leedle deedle quilts. 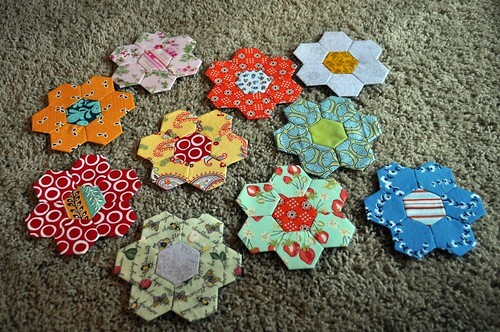 I LOVE this project of hers (she brought it for sew-n-tell that night), and thought I might maybe start a hexagon quilt. I'm not all the way decided on that, but I am thinking making a pillow, or maybe two, might be more realistic for me. I wanted to share a couple of things quickly (we have kind of crummy internet here, sigh)--Amy from the cute life started making some Dear Jane blocks; I love them. Some of them are the same ones I made for my Kona challenge No Prints Allowed/Jane Stickle 9-Patch. And I heard from Jessica at Favequilts.com, and my crooked pumpkin quilt block tutorial was included in a round up of twelve pumpkin quilt block patterns. Check it out if you need some fall sewing inspiration! Hopefully I'll be able to start posting here more regularly--I've missed sewing, and sharing about it here too. I have some other sewing projects I'm planning on working on in the next few weeks too. I hope you have all been doing well! Today's the big day, well one of them. 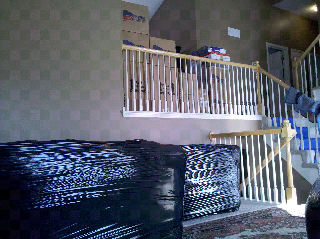 Yesterday everything got packed up. Our suitcases are packed for the next 2 months in corporate housing, everything else is going on a truck today and then into storage. The house goes on the market tomorrow, fingers crossed that it'll sell quickly!